How Do I Find Allocated Stock? How do I find out where my Allocated stock for a particular product is? Run the Product Integrity Check first form Products / Utilities / Check Product Integrity. 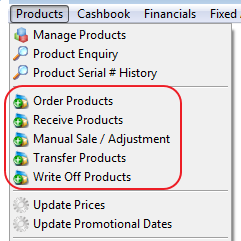 Enter the Product Code as necessary; clear out the 'from' date so it will search all Pending Invoices. If there are forward-dated invoices then change the 'to' date as well. 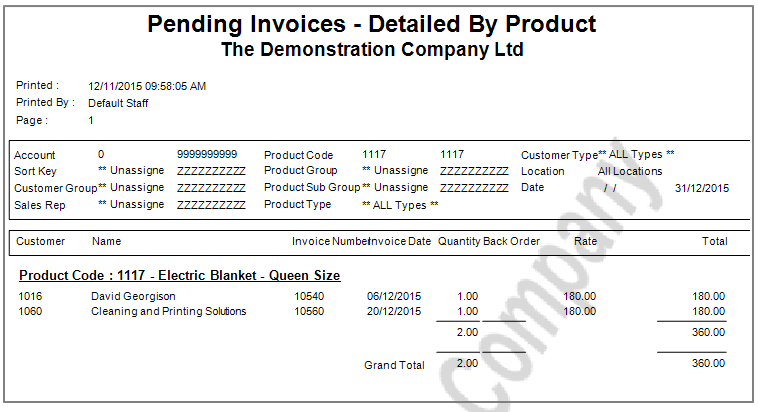 In this example there are two Pending Invoices with two Electric Blankets. From Version 8.470 a new report was added under Products / Reports / Product Transactions - Pending. We can see it is a transfer, go to the Transfer screen to locate the Saved Transfer and recall. The next place to check is the following group of functions in Products. Open each function and look at all locations to see if there is a pending transaction. Using the example above, one was found. Using the above steps we have now found all 6 Allocated items. **There is an inconsistency in the pending invoices report that does not show the components of the Kitset set as "use when Invoiced" when the Pending Invoices report is run. It is necessary to check the Kitset tab to see if the Product has been used in any Kitsets. If it has, run the Pending Invoice Report again looking for the Product Code shown in this screen.